*New piece I just wrapped up for @SquareCarousel! The people of the city in a panic, the police phone rings off the hook, no crime's being broken so they can't do anything, the priest unable to perform the ceremony, yet unable to deny them, and the most unlikely couple happily walk off to cause chaos while mercilessly ending the plague known as Man. I'm just really happy they're finally married! 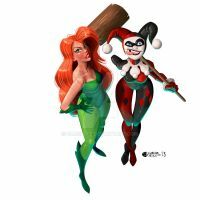 This may be a stupid question but are they Harley Quinn and poison ivy? By the way cool illustration, it's beautiful. Thank you so much!! And yeas! 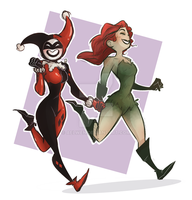 Harley, Ivy, Bud and Lou! !